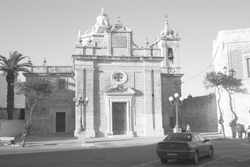 Information: Safi became a parish in 1598 and the building of the present church started in 1726 in a locality where in 1564 there was a small church dedicated to St. Paul. Other information on churches under this parish: St. Mary's Church The church was already in existence in 1575 as Mgr. Dusina mentions it in the report of his pastoral visit; it was closed in 1683 and restored in 1970. Today it is used as a chapel for Eucharistic Adoration on Tuesdays.